Hello everyone, you are very welcome here. 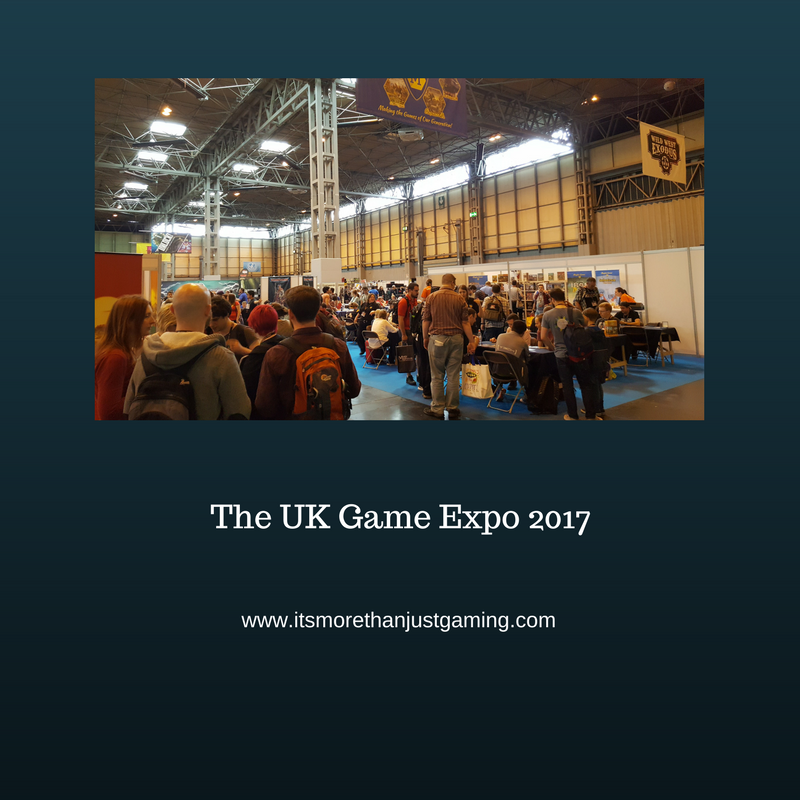 In this post I am going to talk a bit about my experience going round the UK Gaming Expo as a guest, however, unfortunately, I won’t be able to give my thoughts on everything available as I only really had time to wander round the trade stalls and have a chat with some developers to see what stuff is available that I had never heard of. I have picked out my favourites to write about today. Dead Throne (On KS from 1st June 2017, so, now…) is billing itself as an open world RPG set in the realm Veles of where all the players are vying for the throne of Lirenor. I got to see a prototype set up and I have to say, the production quality is high and it looks awesome. I am going to do a full write in a future post, so I will leave it at that just now – suffice it to say, it looks amazing and it was the first thing that stood out to me at the Expo Trade Hall. I would say the Kickstarter Goal is quite high, however if the project doesn’t fund you lose nothing by backing it and last I checked there were quite a lot of Early Bird pledges left. Colourful things draw my eye, as you might expect (I am a bit of a gamer magpie) and the booth for Scrooge definitely fell into that category. Hitting Kickstarter in September, Scrooge is a competitive game where players attempt to out-Scrooge Scrooge…and each other. They travel the board trying to make money, dealing with nightmares and ghosts and other obstacles and resources. I liked this as all the characters in it were from various Dickens books, and that was just fun. It also looks like a good Christmas game for a bunch of friends or family to have a laugh about. Will talk more about this game in the future when I have more to say. As part of my trek around the Expo I found myself talking to Nick Swift, creator of the Card Game Modern Horrors. He very kindly gave me a copy to review, so I will do full post shortly. Suffice to say, Modern Horrors is a fast paced game that pokes fun at modern life, with hilarious artwork and satirical stereotypes. Keep your eyes peeled for the future post, it will be worth it. Great Scott! I invented the Personal Handheld Blurry Cam! Ok, so I had very limited time in between my various volunteering shifts (not a complaint) and truth be told, I can only scratch the surface else I would be writing for hours and hours, and your reading would stop long before you got anywhere near the end. So, I give over the rest of this post to a few photos of other things that I saw. As I say, I can only really scratch the surface of the Expo – I hope this gives a flavour and an encouragement to attend next year. I am going to the Moniaive Comicon this weekend as it happens. Very small event not far from my home town. Alan Grant of 2000 AD runs it apparently. Not sure if there will be any posts but who knows? This looks like it was a lot of fun! I’ve never attended a convention, but I think it’d be interesting to volunteer for one. Meeting like-minded people is always awesome, and you got to check out so many cool new games! Excited to read your post on Modern Horrors.